I saw this on BBC yesterday. It is so-o awful on many levels that Dana addresses. BBC: Fukushima: Is fear of radiation the real killer? [snip] At Fukushima University Medical School Professor Shinichi Suzuki leads the team studying the children of Fukushima. A cheerful round-faced man with a grey moustache, Prof Suzuki is frustrated by the constant likening of Fukushima to Chernobyl. "The first thing to understand is that the amount of radiation released from Fukushima was much lower than at Chernobyl," he said. "Second, the number of children in Fukushima who got a radiation dose above 50 millisieverts is very few, maybe as low as zero." Well...the BBC have become confused as to what their function is. Statements like this are madness and quite wrong. To me it signals a total break down of the principles of Journalism, for ''who? what? why? when? and where?'' no longer seem to be it's staple diet in any shape or form. The Fukushima releases of cesiem-137 alone are 10,000 to 100,000 times greater than all previous radiation data combined, including Chernobyl. 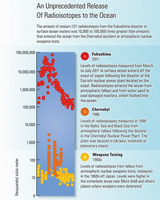 Fukushima's c-137 is shown in red on this chart where yellow are the weapons and tests, orange is Chernobyl. Radioactive isotopes from the Fukushima meltdown spread to the western United States within days of the incident, according to Vetter, but in diluted form. In testing the air in Berkeley, milk produced in California, and salmon from Alaska, Vetter found that radioisotopes such as cesium 134 and 137 peaked in 2011 at levels far below public safety thresholds and have since declined to background concentrations. RE - Today's show and the Vancouver Sun. Added to my nuke shill series on my blog. Vancouver Sun parent media group headed by by a guy from Ontario Power. This week NOVA (on PBS) had a lie-filled account of 3-11. If you click on the "Broadcast Credits" you get a list including the episode funders. Original funding for this program was provided by Cancer Treatment Centers of America, Google, the David H. Koch Fund for Science, the Corporation for Public Broadcasting, Public Television Stations, Millicent Bell through the Millicent and Eugene Bell Foundation, Roger and Vicki Sant and the Montgomery Family Foundation. We know who the evil Koch brothers are and some of these but who/what is this Millicent and Eugene Bell Foundation? Dr. Bell then went on to founded TEI Biosciences Inc., a Boston scientific company that develops products for tissue repair and regeneration and, again, was responsible for new replacement designs. He served at different times as chief executive officer, president, chief science officer, and a board member. He also was a research scientist and corporation member of the Marine Biological Laboratory in Woods Hole, Massachusetts. They are evil scum. I don't see how they can live with themselves. People around them must hate the miserable SOBs, like we do. Woods Hole slogan "A Mind is a Terrible Thing to Waste"! Monsters working overtime to think these fantasies up! Biologist Timothy Mousseau, who is this guy? "Professor Timothy Mousseau received his doctoral degree in 1988 from McGill University and completed a NSERC (Canada) postdoctoral fellowship in population biology at the University of California, Davis."